You all know how I revere EZ, but now I think about it there’s something off about the name of this pattern. Baby Surprise . . . it conjures up associations with ’50s cookbooks. You know, the American culinary era when vegetables were boiled until unrecognizable, everything contained Velveeta, cream of mushroom soup, and crumbled potato chips, and what was for dinner was entitled something like, well, Chicken Surprise. 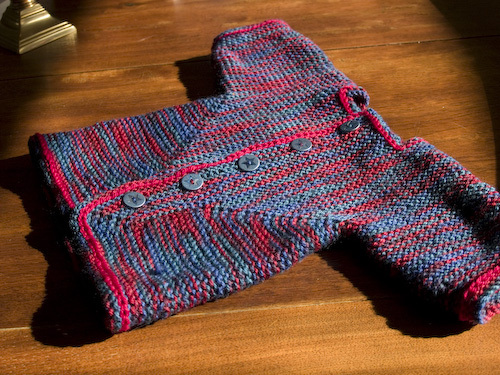 Finished size: Perhaps for a six-month-old baby? I’m terrible at guessing baby sizes, but I know it’s too big for a newborn. Modifications: Only the addition of the simple crochet around the edges. I thought the variegated yarn wanted visual pulling together. And I had some scraps of Dale Baby Ull in an appropriate red left over from my Sockapaloooza socks. Overall, I’m delighted by this little sweater. The construction is so clever and unusual. I was guessing at the pithy directions a couple of times, but I guessed correctly and all turned out well. Now it’s off to pack my rain gear for an afternoon of cyclocross spectating. Mr. Garter is racing this morning, but I’m not with him because it’s the last day of plant dyeing class. He’s going to pick me up afterward and take me back out to the course so we can watch the top men’s race, though. My own physical activity for the day will be cycling down to Sellwood for class, since Mr. Garter took the car. Cross your fingers Mr. Rochester and I don’t get too wet on the way. (Mr. Rochester is my back-up commuter bike. He’s not as cute as Domitilla, but he’s strong, manly, a little rough around the edges, and clearly has a salacious past. There are stickers of anime babes and a woman licking the crossbar right between my thighs as I pedal along. It makes me feel a little dirty if I think about it too much.) Okay, off I run. Ha ha – love that the bike is named Mr. Rochester. Too funny. NYC Marathon blew through the city today… remember how we watched from Central Park last year! Good times. The Baby Surprise jacket sure turned out nicely. I’m going to add that to my list of Zimmerman projects to try! love the baby surprise jacket! it’s so cute. might have to consider that one for my little peanut. can’t wait to see the final dye project! This is an adorable sweater. I LOVE the color! The baby seater is lovely, nice job finishing. Love your baby surprise. Very cute buttons too! i actually ran across a friend who is trying to do the baby surprise sweater, and i told her to come ask you. Fabulous FO! I love the way the red crochet really DOES pull together the varigated yarn. I think that made a big difference. Good choice! Great baby surprise! The crochet edging really makes a nice finish. I was wondering which EZ book this is in? I haven’t picked up any of her books, and would like to get this pattern. Very cute sweater! The edging is lovely. And your promiscuous bike makes me laugh! Adorable baby jacket, Sarah! The colors compliment each other perfectly. It’s going to be loved and cherished, for sure! You’re right, baby surprise is a creepy name reminiscent of recipes made with cream of mushroom soup. But the sweater is absolutely delightful! Your sweater is so pretty — I love the colors in it. Lorna’s Laces are one of my favorites. I’m new to your site but envying your Bianchi! I am going to get a new road bike soon, a Fuji. My husband races but we have never seen cyclocross, so I’m looking forward to watching a race next month that will be nearby us. Stay dry!! That sweater turned out beautifully! The thoughts on Baby Surprise made me laugh, and reminded me of a cookbook from the 60’s that my friend showed me. It was shocking how many recipe titles seemed to indicate cannibalism! It’s a lovely little treasure of a sweater. Good call on the edging! The construction is so interesting, as if the fronts were folded together. It came out so nice- who’s it for anyway? Is that a surprise? 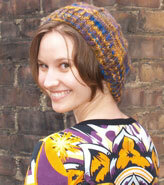 That Baby Sweater is beautiful; the colors are fantastic as well, and that edging really makes it perfect! but this jacket is grand. and i think we’re all awful at guesstimating baby sizes. mine are always too big and usually become toddler knits. 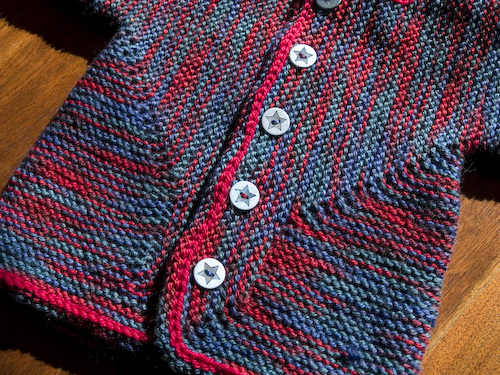 Would love to try the baby surprise jacket pattern. Could someone provide me a copy of this pattern? Thanks from Rio de Janeiro.